The recent blooming of goldenrod has brought about an autumn resurgence of bee activity. This will likely be the bee's last big food drive before settling in for the long winter months. 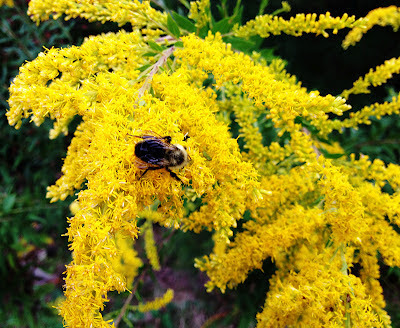 While on a walk with Darby, I photographed this bee, who was buzzing from plant to plant, along with dozens of her brethren. I took this photo with my iPhone 4s, which has better close-focus ability than I would have suspected.